I have a large family, but I can only trace it back so far. On my mother’s side, I can go back as far as my great-grandparents and on my father’s side, just to my grandparents. This has always bothered me. I was two months shy of my nineteenth birthday when my father died, and I felt like he took his half of the family tree with him. I had yet to mature into the kind of child who’d want to know more about from whom and from where they come. Sometimes I catch episodes of Henry Louis Gate’s Finding Your Roots, and I wish for the type of fame that would award me a chance to be a guest on his show. To have him lay before me a photo album full of images of my ancestors and their stories of victories, triumphs, and accomplishments as well as their hardships and misfortunes. I would just be grateful for the pieces I’d be gifted to piece my personal history together. But even if I had all of this information I would inevitably reach a dead end. I would only be able to trace my lineage so far, and that is a tragic reality to accept. 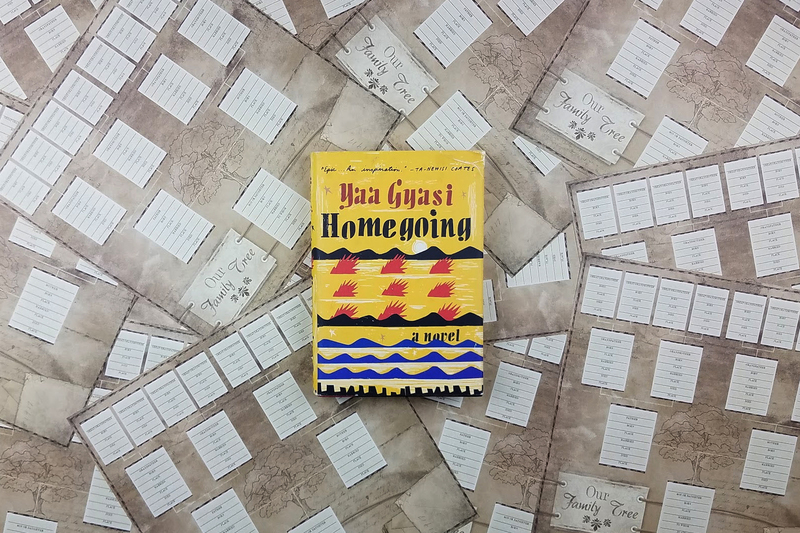 In 2016, Yaa Gyasi’s debut novel, Homegoing, was published and quickly became one of my favorite books of that year. Homegoing is the telling of a family’s history from Ghana, through the Transatlantic Slave Trade, into Slavery, Jim Crow, to present day. In Homegoing you get to read about one family, starting with two half-sisters whose paths cross although they never formally meet. We go on to read the stories of their children and their children’s children. One half of the family in Ghana, the other in America. Both sides experience more than their fair shares of hardships, tragedies, and pain. Despite the harrowing ordeals I bore witness to in the pages of this book, when I read the last page it still gave me a sense of completion I’ll never experience in my lifetime. As I read the stories of Esi and Ness, Kojo, and H I thought of what it would be like to know that these were my relatives. To know their names and their stories and know that because of them I came to be. Homegoing granted me that wholeness if only temporarily and reignited a desire in me to know more about those who came before. Although I can’t stake claim to the characters in this book as family of my own, I know their experiences were shared by those I do belong to. My heart swells with pride and gratitude that they withstood all they did so that I can exist today and I don’t take it for granted. I am grateful for novels like Homegoing that serve as a reminder of the power, strength, and resilience that runs through my veins.